Lama Zopa Rinpoche during a talk given at Kasih Hospice Service, Malaysia, April 2016. Photos by Ven. Losang Sherab. 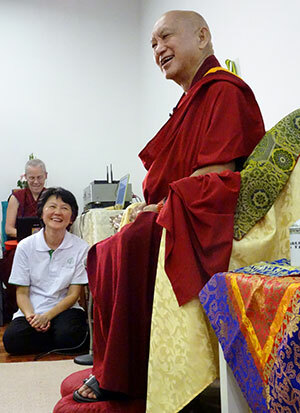 Lama Zopa Rinpoche is currently teaching in Malaysia. Lama Zopa Rinpoche leading extensive Medicine Buddha puja during a lunar eclipse at Chokyi Gyaltsen Center in Penang, Malaysia, March 2016. Photo by Ven. Lobsang Sherab. Lama Zopa: Merely thinking of helping someone! … Is far, far, far greater, infinitely greater, than making offering to buddhas! 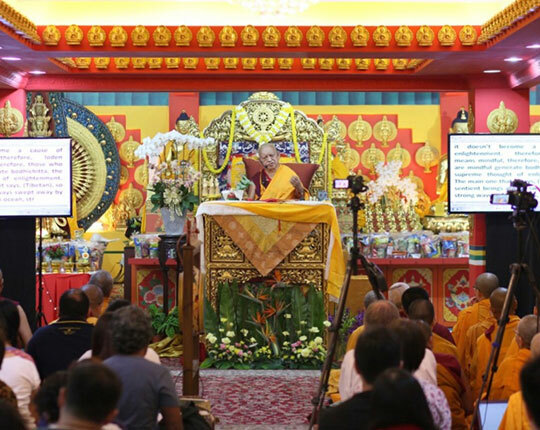 Lama Zopa Rinpoche teaching at Losang Dragpa Centre, Kuala Lumpur, Malaysia, April 2016. Photo by Ven. Lobsang Sherab. Read Ven. Roger Kunsang’s update and thanks for the practices done for Rinpoche’s long life. The praise to Lama Zopa Rinpoche offered on behalf of the entire FPMT has now been translated into Spanish; as has the Long Life Prayer for Kyabje Lama Zopa Rinpoche, spontaneously composed by Khadro-la (Rangjung Neljorma Khadro Namsel Drönme). Subscribe to our FPMT news blog to get updates as soon as they are announced. Rinpoche Available Now – Enjoy livestreams of many of the teachings above and recordings of Rinpoche’s most recent teachings! A short Hevajra sadhana, The Essence of Dispelling Errors, is now available through the FPMT Foundation Store to those with the appropriate initiation (Nine-Deity Hevajra). Sutra Remembering the Three Jewels, which is recommended to be recited on Buddha multiplying days by Lama Zopa Rinpoche, has been added to Education Service’s sutra resources page. Visualize a Food Offering for 30,000! 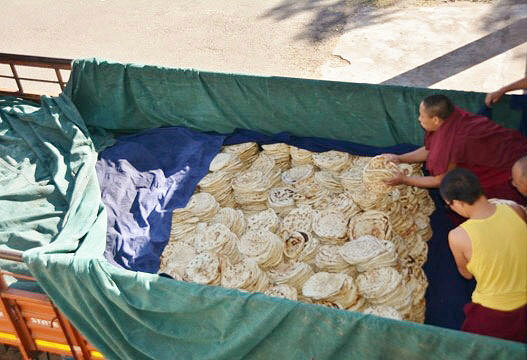 Can you imagine the effort and skill required for volunteers to prepare, cook, and transport rice and bread for 30,000? Last December, 150 monks from the Sera Je Food Fund Kitchen woke up at 2 a.m. every morning to help feed 30,000 participants of His Holiness the Dalai Lama’s Jangchup Lamrim teachings. You can read how they did this in a recent blog from FPMT Charitable Projects. Mandala’s newest online feature – Human Spirit: Bridging Buddhism and Psychoanalysis in Israel – demonstrates how FPMT centers can creatively collaborate with non-FPMT organizations to bring the power of Buddhist thought and the tools of FPMT education programs into diverse contexts and traditionally non-Buddhist cultures. FPMT-registered teacher Ven. Sangye Khadro describes how Istituto Lama Tzong Khapa worked with the Israel Association for Self Psychology and the Study of Subjectivity to develop a seven-year psychoanalytic training program that incorporates Buddhist philosophy and meditation into its curriculum. Offer support for FPMT education and many other International Office activities. Enjoy complimentary access to prayers, practices, ebooks, Mandala Publications and FPMT Online Learning Center courses. Join the hundreds of Friends of FPMT who are helping build the compassionate vision of FPMT throughout the world. 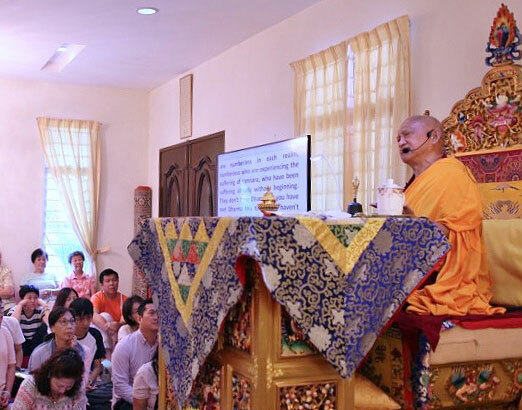 Lama Zopa Rinpoche during a talk at Kasih Hospice Service, Malaysia, April 2016. Photo by Ven. Lobsang Sherab. In case you missed it on the CPMT e-group, the International Mahayana Institute (IMI) – with grateful thanks to all centers, projects, services who contributed to the Lama Yeshe Sangha Fund – recently sent out a report on their activities during 2015. This thangka of the Seven Medicine Buddhas was painted for the FPMT Foundation Store. The Seven Medicine Buddhas and Shakyamuni Buddha represent the ultimate sources of healing. Receive a special discount when you invite this holy object into your FPMT center, project or service for your students and supporters to enjoy today. Tushita Meditation Centre, India is looking for a center director; Atisha Centre, Australia, is looking for a spiritual program coordinator; Root Institute, India has several volunteer opportunities.